My best salad dressing recipes will inspire you to eat salad all day! These raw homemade salad dressings are low in fat, low in calories and majorly high in flavour. Fresh food ingredients can be blended up in surprising and delicious ways to make healthy salad dressings that will inspire your tastebuds. 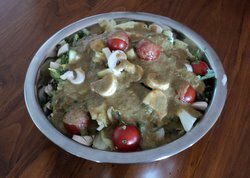 I’ve been inspired recently by Andrew Perlot’s excellent Savory Raw Dressings and Sauces e-book to experiment with low calorie salad dressing recipes that are raw and also low fat. I’ve also just begun a new phase of eating a 95% raw food diet so discovering Andrew’s book has coincided beautifully. There are a few tricks to getting my best salad dressing recipes to work perfectly with your salad. Make sure that your greens are really dry. Getting your salad dressing to stick to your leaves is important, otherwise you end up with a pool of juices underneath your salad and nothing on it! When blending your salad dressing, make sure you have enough volume to cover up your blender’s rotors. Even though you may end up making more than you need for right now, if you don’t make enough to give your blender something to grab on to and spin you’ll probably end up adding more water than you need to in order to get the ingredients blended smoothly. Get your salad dressing the right consistency by starting with drier ingredients and only gradually adding the wetter ingredients. I like mine thick and creamy so I usually add less water than most recipes ask for. Another trick to getting your salad dressing thicker and creamier is to throw in the flesh of the lemon or lime when called for, rather than just the juice. Slice off the peel and throw the whole inside in – extra fibre, hooray! As you experiment you’ll learn which flavours mix and match perfectly with your palate. Other people can make recommendations, but you’ll have unique preferences. Part of the fun of raw foods is reawakening your tongue to taste sensations and the glorious diversity fresh fruits, vegetables and herbs. Herbs are the business. Adding ¼ - ½ cup of fresh herbs to a salad dressing can take it through the roof! If you don’t already have a herb garden, it’s not a crazy idea to start one. It’s not that hard to get a small, simple herb garden going to supply your raw food cravings. You’ll be surprised how hardy some herbs are and just how quickly they grow. Okay, on to my best salad dressing recipes. Although these are raw and healthy dressings I’ve created myself, I have to give conceptual credit to Andrew Perlot’s Savory Raw Dressings and Sauces e-book , The Raw Food Coach’s 50 Quick Easy Healthy Delicious Recipes e-book and my latest inspiration, Gena at choosingraw.com. Please notice that this collection of raw homemade salad dressings will grow steadily, but slowly. That’s because if you experiment, you have some failures along the way. Only the concoctions that seriously impress my tastebuds will make it to this page. Blend all ingredients until creamy. You may have to scrape down the sides of your blender a couple of times to ensure all the nutty bits are included. 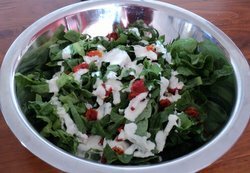 In the photo, I've served Raw Creamy Lemon, Dill and Macadamia salad dressing on a mixture of cos lettuce and low fat semi-sundried tomatoes. This was delectable, but this dressing is also sensational on diced cucumber and zucchini. You can blend this one for a shorter time so that it’s a bit less juicy if you like, and more chunky like salsa. Tastes brilliant either way. This might sound odd, but this dressing is fantastic served on....tomatoes! 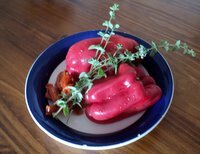 Especially cherry tomatoes that will explode with flavour in your mouth alongside the herbs in the salad dressing. Yum! I think it’s a bit juicy for diced vegetable salads, but it’s great on green salads and you can eat the remainders at the bottom of your bowl like a soup. Mix the Raw Creamy Lemon, Dill and Macadamia Salad Dressing and the diced cucumber together. Serve rolled in cos lettuce leaves or poured over a leafy salad with avocado and olives. Not only does this dressing look spectacular but it tastes spectacular too. I wasn't sure if I'd need all those herbs but I ended up throwing them all in and it tasted great. Perfect on avocado and dark leafy greens. You don't need to add any water because the capsicums are juicy enough. If you want even more bite you can add more sundried tomatoes, but this one is pretty bitey already. Peel the oranges then blend all ingredients until well combined. If you like your dressings tangy and sweet then this is the business for you. It tasted great on greens, cucumber and avocado, but not so great with zucchini and broccoli. I had enough left over to use some as a dip for carrot sticks, and that was an excellent combination. As this is a fairly sweet dressing, it can also be made up as a dessert. Sprinkle some sunflower seeds on top and you have a tasty little number that will satisfy sweet cravings. I love avocados, and at least half my salads contain avocados. When I make a kale salad, I usually massage the leaves with olive oil, salt and avocado to soften them up a little. This time I decided to try an avocado dressing and mix that through the leaves. It was a winner of an experiment! This is a fabulous way to get more out of your avocado. Blending an avocado up with water makes a creamy and fluffy dressing which retains all the flavour. If you're after a low-calorie salad dressing that is creamy AND bitey then give this a go. The cucumber adds enough juice without making the dressing too runny. So that there's no need to add water, start blending on a low speed until the chunks of cucumber have been caught up in the blades and some of the juice has been released. Then up the speed until your mixture is creamy and smooth. This is one of the best salad dressing recipes for sticking to the leaves of your salad as there's no added water and the avocado clings nicely.